When they first met at high school, little did Abigail Whitfield and Stuart Kilpatrick know they were destined to be together. They were introduced by Abigail’s brother and got together a few years later. A proposal came at home, in front of their children, triggering plans for their big day at Bartle Hall surrounded by family and friends. 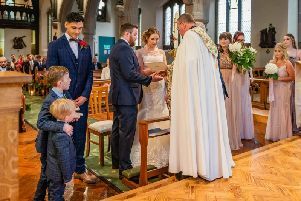 Abigail said: “I hadn’t felt nervous all day until it was my turn to walk down the aisle! “They opened the curtains and I burst into tears. The groom works as a scrap man and is 31. He is the son of Peter and Patsy Kilpatrick. And the bride, who is 33 and a stay-at-home mum, is the daughter of Andrew and Linda Whitfield. Chief bridesmaid was Keeley Whitfield, with Rhianna Whitfield as bridesmaid and Charlotte Moody as the flowergirl. With the groom, Carl Moss was groomsman and Roman Kilpatrick was pageboy. Abigail made all the table decor and hadn’t seen it all set up together until after the ceremony. She said: “I was overwhelmed at how fantastic it all looked. “My husband hadn’t had much input into any of the decor, I think even he was shocked at how well it all turned out. “Our guests made us a sparkler tunnel in the gardens, which was scary! I think we narrowly avoided lots of burns. “We enjoyed every minute of our day, sharing it with good friends and family. The couple, from Ribbleton, honeymooned in Fuerteventura.